Alcohol • DABC finds 2 outlets behind in payments, even as busiest store reopens. 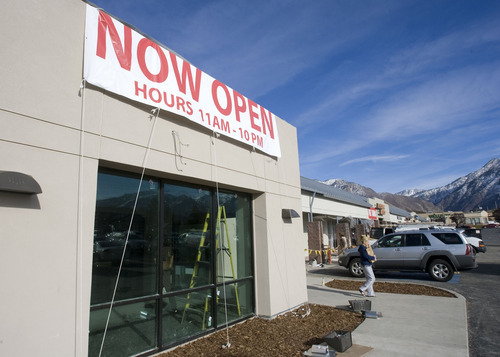 Al Hartmann | The Salt Lake Tribune The liquor store at 1863 E. Fort Union Blvd., Cottonwood Heights, the state's busiest liquor outlet, has reopened. The store was closed for remodeling in July and was scheduled to reopen in October until asbestos was discovered underneath the flooring. Al Hartmann | The Salt Lake Tribune Store clerk Sami Stone stocks wine racks at the newly reopened liquor store at 1863 E. Fort Union Blvd. 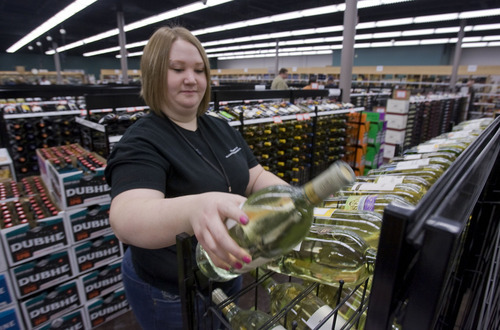 The liquor store, which is the state's busiest, rang up sales of $16 million last year. Liquor-control commissioners learned Tuesday that two privately run outlets, called package agencies, are behind in payments to the state, the internal audit revelation coming against a backdrop of criticism that retail operations have been mishandled. Mixed in with good news that the state is reopening its busiest liquor store, in Cottonwood Heights, after a remodeling, audit manager Greg Rogers told them that the outlet in Kanab is behind $8,600 in payments and the Payson outlet is short by $2,300. A follow-up audit is scheduled for next week. In the past, package agencies that have not brought payments up to date have been recommended for closure. The five-member commission makes the final determination. In July, commissioners voted to close the Gunnison package agency, whose operator was at least $6,000 behind in payments. A new store has since opened. Earlier this year, legislative auditors criticized senior managers of the Department of Alcoholic Beverage Control (DABC) for failing to inform liquor-control commissioners that the now-bankrupt package agency in the Ogden Valley town of Eden was behind in its payments by $300,000. Despite falling behind, agency managers continued to ship liquor to the outlet that wasn't being paid for. That audit was one of several examinations of the agency, including one charging that senior managers had routinely rigged bids and falsified financial reports to bypass state procurement laws. The latter audit, released in October, also concluded that the DABC "has been incompetently managed." On Tuesday, interim DABC Executive Director Francine Giani released a report to commissioners, detailing steps the department is taking to shore up its operations. Gov. Gary Herbert asked Giani, who also is director of the Commerce Department, to take over DABC operations until a new director can be hired. Herbert had also called for former director Dennis Kellen to step down this summer after auditors questioned business dealings totaling more than $370,000 that the department conducted with Kellen's son. The Attorney General's Office has launched a criminal investigation into the matter. Package agencies and the 42 state-run liquor stores also have been the focus of a business plan developed at the direction of the Legislature by the Salt Lake City-based consulting firm Bonneville Research. Bonneville principal Bob Springmeyer has taken to task liquor-control commissioners who spend 90 percent of their time deciding who gets restaurant liquor permits, while taking only a few minutes each month to look at liquor stores  which generate more than 80 percent of the agency's income. On Tuesday, commissioners spent more time deciding whether to grant a liquor license to a wedding reception center in West Haven  including whether food quotas could include catered meals  than in discussing store operations. The business plan was released to a legislative interim committee last week and has yet to be studied by the DABC. The plan calls for the compliance functions, such as granting liquor licenses, to be transferred to the Department of Commerce, giving time for liquor commissioners to focus their attention on retail operations. Although the Cottonwood store reopened on Tuesday, the DABC has yet to add the store's location to its information website. The store, which rang up sales of $16 million last year, is not easy to find, nearly hidden behind a car wash. By law, the state is not allowed to advertise about it location. Giani said the Cottonwood site is leased and that it is her understanding that the car wash will be torn down, perhaps by next summer. The store was closed for remodeling in July and was scheduled to reopen in October until asbestos was discovered underneath the flooring. The reopening is in time for the holidays, the busiest time of the year for the state-run liquor monopoly. Address • 1863 E. Fort Union Blvd., Cottonwood Heights. Caution • Work still under way, but officials say customers are safe.